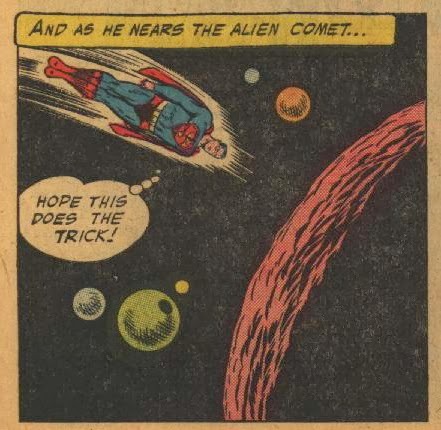 Silver Age Comics: Those Pesky Asteroids! 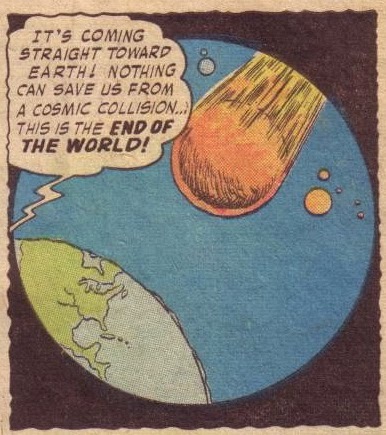 And comets, meteors and rogue planets! Here's another thing I noticed in my reading of the Action Comics starting with #200. Superman seemed to spend half of his time saving Earth from one asteroid or other bit of cosmic debris after another. 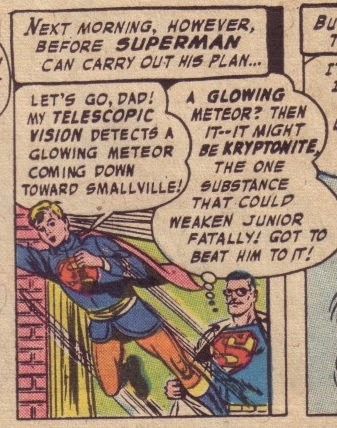 In some cases, these asteroids/comets/meteors performed functions similar to Red Kryptonite later in the Silver Age. 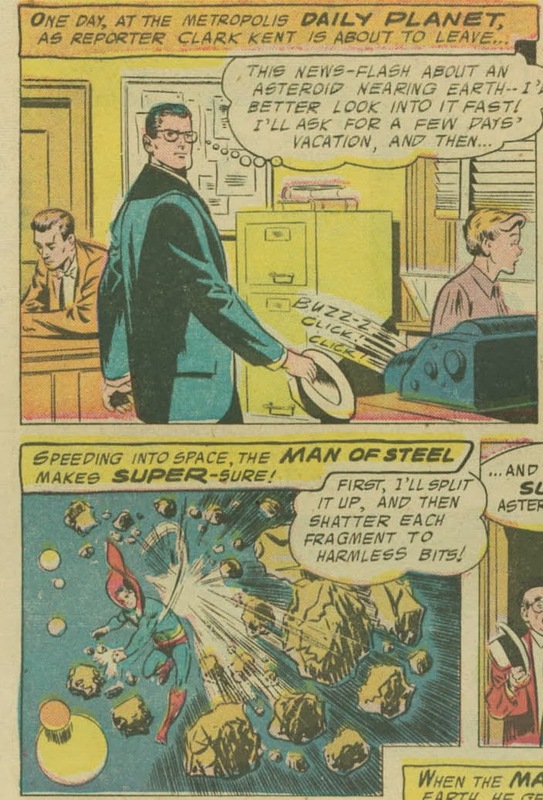 For example, the comet in #221 imparted to Superman a magnetic power that was handy at times, but gave him headaches in his secret identity as Clark Kent. 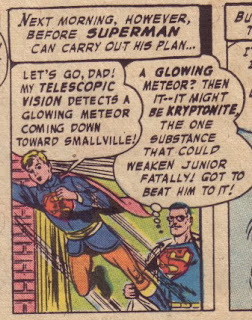 The meteor in #232 ended up giving Superman the powers of Superman Junior. 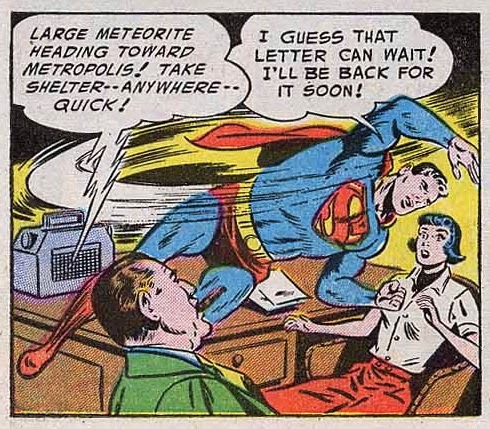 The meteorite in #204 appeared to force Superman to perform all his super-feats while standing on his head. 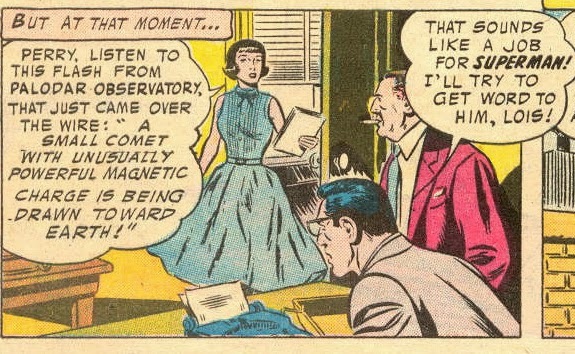 And the comet in #227 was thought to have caused his X-ray vision to become uncontrollable. I'll see if there are any further examples of this. 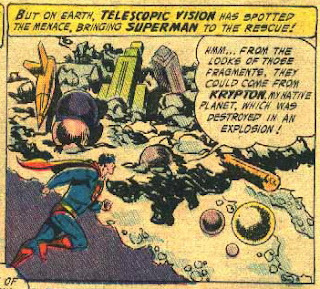 I seem to recall that one of the episodes of the Superman TV show in the 1950s also featured Superman saving Metropolis from an asteroid. Your memory is correct! 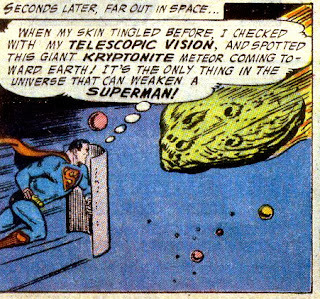 The 38th episode of the Adventures of Superman was "Panic in the Sky," a black-and-white episode that was one of the best in the series. Many thanks for your wonderful blog; it's a lot of fun. "Lois and Clark: The New Adventures of Superman" did an homage to that episode. Also, rocket scientist Willy Ley was advisor to one of the 1950s SF shows on TV -- maybe Tom Corbett, Space Cadet? He said later that about the only thing he accomplished was to make sure that the space ship didn't get hit by a meteor EVERY week. 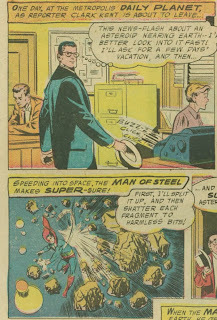 Kirk is correct about Willy Ley being an adviser to Tom Corbett, Space Cadet. I'm reading that series of books now and they are surprisingly interesting and, of course, action packed! The Corbett books are now in the public domain and, if the first three are representative of the series, they're well worth the download. Great blog entry; very enjoyable. 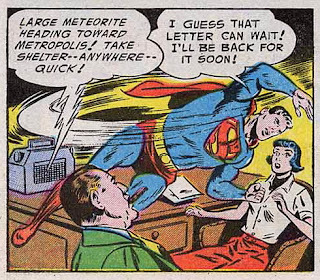 Not only Lois and Clark, the Superboy TV show did a homage on the asteroid "Panic in the Sky" Superman episode. And like Superman, Superboy came back to Earth without his memory.